Unique Big Duck Shape : Pets will simply love to chew and cuddle this adorable toy. It is a good partner for puppy to play and sleep. Safe & Soft Material: Crafted from high quality fabric material, the super-soft dog plush toys are harmless to your dear pets. Fun Hidden Squeaker: This duck toys is equipped with a squeaker inside that makes a soft sound when squeezed, your dog won't be able to resist. Chewable & Exercise: Dogs will chewing pleasure with this durable squeak dog toy, Great for indoor and outdoor healthy exercise.Well suited for fetching and catching games. Satisfaction Guarantee: Available in both dogs and cats. Notice! Pets should be supervised when playing with this ducky as no toy is completely indestructible. Free return and exchange, contact us if any quality problems. Adorable & affordable This toy my dog could not wait to get to. The second I open the box, he knew it was for him. He loved it the way it fit into his mouth, made it easy for him to carry it around. Vibrant colors. Gonna get one as a gift for my sisters dog too! The durability, my dog is tuff on toys, hoping it will last. Plush duck great for small dogs My yorkie absolutely loves this duck toy. The squeaker is large enough he can squeak it often. It's quite large but he still loves dragging it around the house. It wouldn't last long for bigger dogs like my border collie so I have to keep it away from her. Color is nice and bright. None, it's great. People with smaller dogs Great for smaller dogs or dogs that don't tear plush toys. Jomilly Dog Plush Toy Great toy for dogs. dogs like the sound and the material of the toy. The color is bright yellow and easy to spot. I do not see any defects in the toy. the duck is for, dogs or any thing that like stuff toys. The Jomilly Dog Plush Toy is a great way to keep your dog entertain. Great sized toy with loud squeaker inside Duck is very well made and was packaged extremely well to prevent any moisture or damage in shipping. Squeaker inside is loud. Product is stuffed very full, so squeaker in middle a little tough for my dog to squeak but she is a smaller dog. Bigger dogs would have no issue attacked this squeaker. packaged well and product made well. colors are bright. No real suggestions to make any better. Dog owners with dogs over 20 pounds. Great product and fun for my dog. 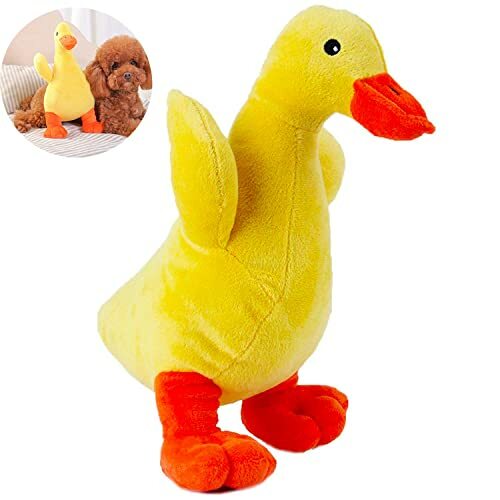 Hey,come to try Jomilly Dog Plush Toy, Cuddle Squeaker Ducky for Puppy Cat, Big Yellow Sharp Duck Toy for Small Medium Pets（Avoid Dog Bites） now.It's a trial rebates.